Recently, I’ve been talking about adding productivity to your workflow, via plug-ins for InDesign, actions and styles for Photoshop and graphic styles for Illustrator, but we rarely think of products that have nothing to do with the creative applications we use on a daily basis. Today I have a two such products to talk about—iClip and CubeDoor—that can help not only boost your productivity, but your creative “space” as well. Enter Inventive’s iClip, a multiple-clipboard and scrapbook utility for Mac OS X. iClip allows you to copy and store multiple items (text, objects, images and more) by the standard Copy menu item (Command-C) or by simply dragging the files into iClip’s bins. You can then insert them into your documents via the Paste command (Command-V) or clicking the Unload button in iClip. iClip shines because it allows you to store your clippings into groups, which remain stored, even after you restart your Mac. It also lets you customize keyboard commands for every iClip action and automatically show or hide the iClip bin on three different sides of the screen. I can’t tell you how useful iClip is in an everyday workflow. Not only will you find yourself using it for your design work, but if you use it for a while you’ll find that it’s a great addition for Web surfing and email as well. I often find myself having to copy an image off of each page in a multi-page InDesign document to place in another document. Rather than cutting and pasting one at a time (since you can only copy objects from an active page in most page layout apps that I know of), or moving them all to one page and then copying them, I can perform these actions more naturally with iClip’s “copy now, paste later” workflow. And, on top of it all, I have to say that iClip the best-looking utility for OS X that I have come across in a long time. iClip 4 is a Universal Binary application and will only set you back a measly $29. Give the demo a spin; I’m sure it won’t take long for you to realize how useful it is. If your needs are simple and the $29 is a little more than you’re willing to spend, how about free ? Check out iClip Lite, a free Dashboard Widget that offers some of the same features as its big brother. Everyone has their own way they like to decorate their surroundings when working, especially when you sit in a cubicle for an agency or design firm. But working in a cubicle sometimes offers little or no privacy. For as little as $29 you can change that with CubeSmart’s CubeDoor. 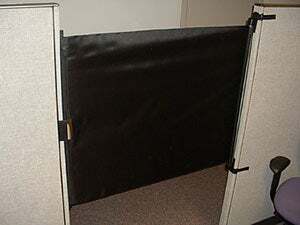 CubeDoors are retractable fabric doors that you install on your cube wall. They provide a quick and easy way to boost your productivity and give you a little privacy for phone calls and the like. To give you an idea of what it is, take a look at this Flash animation created by the company. An agency I worked for years ago had a giant cube island with walls that went about eight feet up, but had no doors. Personally, I hated it when people stood just outside my cube looking over my shoulder at what I was working on! Most of us ended up hanging black shower curtains across the opening for privacy. The CubeDoor would have been a much more elegant solution.